Most frequently asked questions regarding visa on arrival including: requirements, procedures, fees, payment and others. If you have any further questions an other, please contact us. What is “Visa Approval letter”? “Visa approval letter” is the letter issued by Vietnam Immigration Department that allows you to enter and exit Vietnam for a given period. With the Approval letter you can get your visa at one of the three international airports in Vietnam. Noi Bai International Airport (Hanoi). Tan Son Nhat International Airport (Ho Chi Minh City). Cam Ranh Airport (Nha Trang). Cat Bi Airport (Hai Phong). How can I receive my “Approval letter”? A copy of the Visa Approval letter will be scanned with color and delivered to you by email, so please make sure that you have provided us with correct email address. How does the “Visa approval letter” look like? 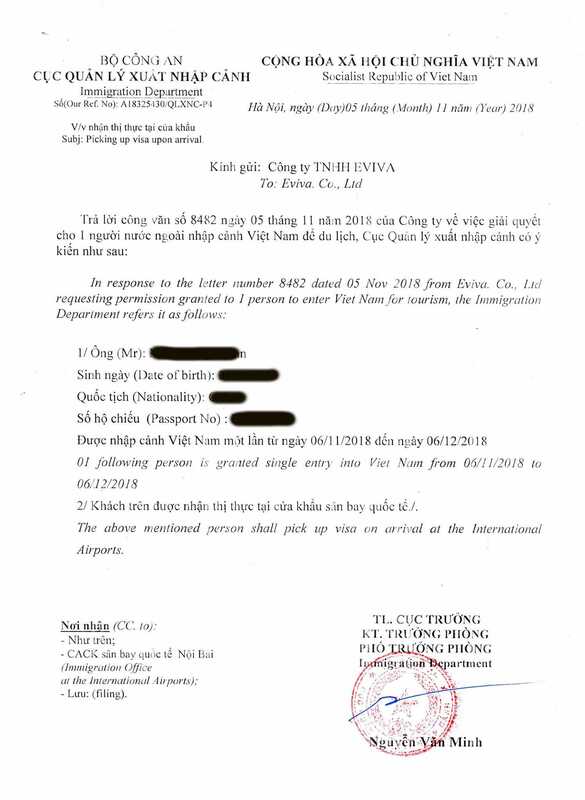 A specimen of how the Vietnam Approval letter looks like. Temporary there is no support for 6-month visa in Vietnam. According to the newly updated information from Vietnam Immigration Department, 6-month visas (single/ multiple) has not been issued since August 24, 2009. Vietnam Immigration only issues 3-month visas (single/multiple) as the longest one. Thus, instead of applying for 6-month visas, clients should apply for 3-month visas (as a longest one up to now). What is entry and exit form? In most cases, a passport scan is not required for an online visa application. However, if the Vietanm Immigration office wishes to verify the information you provide, you are required to send them a scan copy of your passport. In such cases, we will notify you by email immediately. Yes, photos are required at Vietnam airports only. Please remember to bring at least 2 photos (2in x 2in or 5.08cm x 5.08cm). No strict requirements on the photo sizes. To apply for a visa to Vietnam, your passport must be valid for at least 6 months. Therefore, please re-new your passport before applying for one. Should I provide you with exact date of arrival? The exact date of arrival is needed just in case you use our Assistant service. We need the exact date to assist you getting you visa stamped at the day of arrival. This is quite simple: All Vietnam visas are single entry – unless you have specifically requested multiple entry and this is stamped into the passport. The status of a tourist visa cannot be changed from single entry to multiple entries once you have arrived in Vietnam. There is no time frame required to apply for a visa in advance. Though it just takes 2-3 working days to get your visa approved, it is strongly advised to apply for a visa to Vietnam in advance from 1 – 2 weeks in advance to avoid urgent fee and unwanted problems. Visa Stamping fee is the fee that must be paid directly by you to Immigration Department at arrival airport. This fee is charged to get your visa printed out, glued (or stamped) onto your passport and sealed after double checking your visa Approval letter. The visa is stamped onto your passport only if all the information in your approval letter is exactly as in your passport. We currently accept both Debit and Credit cards and PAYPAL: Visa, MasterCard, American Express, JCB and Diners Club. The card expiration is incorrectly entered. Visa Verified password / MasterSecure Code incorrectly entered.